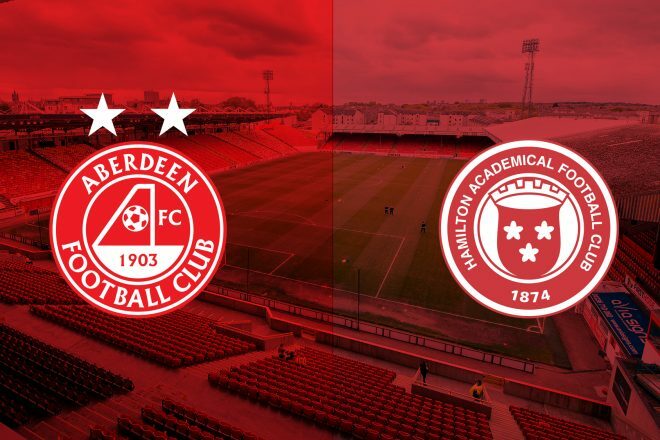 Aberdeen play their ninth domestic midweek game of the season and third against Hamilton Accies this Wednesday. 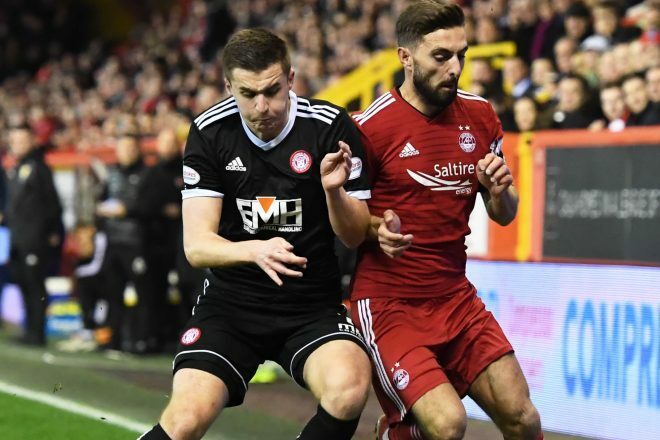 Saturday’s win at St Johnstone started off a busy week for The Dons and a win against Accies would set them in good stead for Sunday’s massive Scottish Cup tie against Rangers. “Brian’s (Rice) clearly wanting to make the most out of the opportunity in management. He has been very positive with his talk, outlook and team selections and good on him for that especially when you’re in a relegation battle. You try and work for clean sheets and don’t get me wrong I’m sure he’ll be working for that, but he’s settling out to win games rather than hoping to win. Sometimes fortune favours the brave and it’s quite refreshing to see that type of approach. “We’ve got big games coming up and we all know that. Wednesday’s the most important and we need to get the win. Starting off in the right manner and hopefully we can go on from there. Even if we don’t we need to stay composed and keep the right form going into the game. “We need to test them early doors and can’t wait until the last half an hour then throw everything at it. We need to start off fast and ideally it would be nice to get the early goal then go again. We need to see what they’re about too because they’re going to have to come at us at some point. Hamilton go into this one on the back of a 5-0 defeat to Rangers on Sunday with Rangers leading early and three quick goals had the game settled by half time. The appointment of Brian Rice has produced positive results however as they fight off the threat of relegation alongside Dundee and St Mirren. After the trip to Pittodrie Accies face a Lanarkshire Derby against Motherwell before hosting Hearts so every point is crucial as the season enters its final few months. This will be the third meeting between the sides this season and the second in the space of only a month. Both matches have ended in convincing victories for Aberdeen. On Halloween night The Dons put in an excellent performance to put Accies to the sword. Graeme Shinnie had the hosts ahead after seven minutes and James Wilson cracked one in from 30 yards before the half an hour mark. Then former Accies captain Mikey Devlin had the audacity to match his defensive partner Scott McKenna’s exploits of last season by thumping home an effort from distance that the goalkeeper failed to deal with. 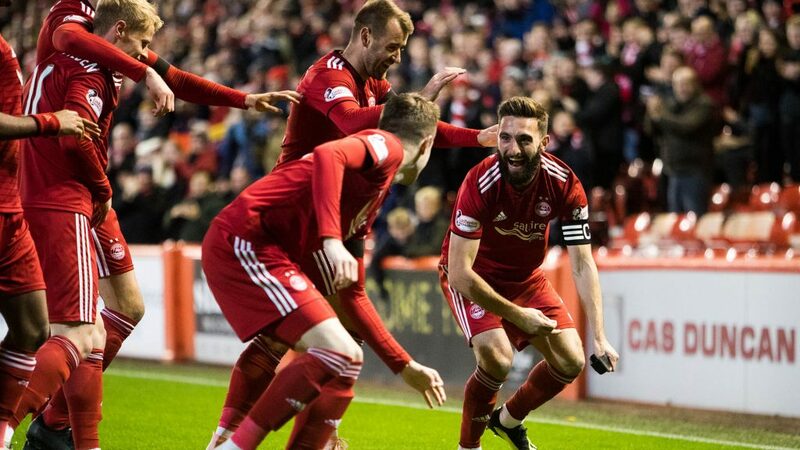 Only a month has passed since the last meeting between the sides and although the scoreline makes it look comfortable for Aberdeen, it could have been all so different had Joe Lewis not denied Kilgallon from a free header early on. Accies started the match very strong, but The Dons came into it and Sam Cosgrove started from where he had left 2018 off pouncing on a rebound from his own header to give the visitors the lead. In the second half Sam doubled his tally and the lead with an excellent run and finished like a man playing with so much confidence. The game was put to bed with the big striker met a corner with his head and as the ball looked to be crossing the line, Lewis Ferguson nipped in to make sure. Despite Sam’s protests the goal went to the former Accies youngster. Wednesday’s match will be the 54th league encounter between the sides and it’s been a fixture The Dons have enjoyed much success in. There have been 39 Aberdeen wins with seven draws and on seven occasions the points have gone back down the road with Accies. The Dons have found the back of the net 126 times and Derek McInnes has a 100% record on home soil racking up 3-0 wins on four occasions. If you can’t make the match be sure to tune into our RedTV coverage from 7.30pm. We’ll have live audio for UK subscribers and International supporters can follow the match with live video. Post-match we will have reaction, highlight’s, goals and a full match replay. Aberdeen came off second best against a struggling Hamilton side fighting relegation, losing 2-0 at Pittodrie. The Dons never really got going and goals either side of half-time sealed the victory for The Accies. 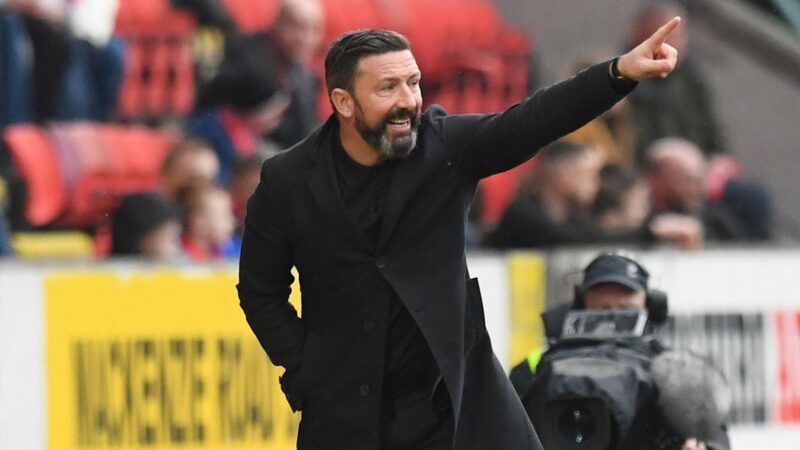 McInnes made two changes to his side with Scott McKenna returning to the starting back four after serving his three-match suspension. Mikey Devlin dropped to the bench. Gary-Mackay Steven dropped out of the squad and was replaced by Niall McGinn on the left-hand side. The Dons came into the game in positive spirits, hoping to build on their 2-0 victory over St Johnstone in Perth at the weekend. Hamilton Academical had a contrasting weekend and were looking to quickly bounce back from their 5-0 thrashing at home to Rangers on Sunday. Aberdeen took a while to settle into the game and surprisingly it was Hamilton who looked the better of the two teams in the opening 15 minutes. Andy Considine picked up an early booking after a professional foul on the halfway line. Shinnie had the first real chance of the game on the counter-attack for The Dons. From an Accies free kick that was easily cleared Ferguson did well to advance forward and pick out McGinn who made a bursting run down the left-hand side. McGinn showed his composure to find McLennan who laid it off to the Aberdeen captain. Unfortunately, Shinnie could not add to his brace he scored at the weekend, his shot lacking the conviction to beat Hamilton keeper Woods from close range. 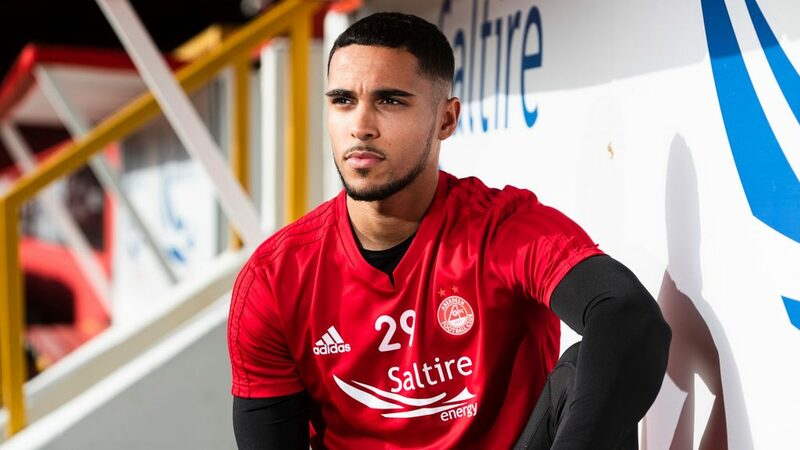 The Dons growing injury listed added another number after Max Lowe was forced off following a knock, Mikey Devlin slotted into central defence to replace him with Considine moving across to left-back. Joe Lewis was forced into bailing out his defence with a brilliant point-blank save on twenty minutes. The Dons failed to deal with a simple ball over the top and Miller managed to get in behind. The striker cut back inside onto his left foot and pulled the trigger. Thankfully, big Joe was out quickly to cut down the angle to deny the forward. The Dons responded well and were unlucky not to take the lead just after the half-hour mark. Again, McGinn was causing problems down the left and picked out Greg Stewart in the penalty area with a clipped cross. Stewart did everything right, glancing his header towards the far post but unfortunately for The Dons the ball cannoned back off the post and away to safety. But it was the visitors who took the lead in extraordinary style. From the byline, George Oakley tried his luck on the half volley. His audacious effort sailed over Joe Lewis and dipped into the far corner in off the post to give Hamilton the lead. The goal certainly gave The Dons a wake-up call and forced them into action. Considine had a header straight at Woods saved before Ferguson squandered a free-kick from a promising position which he hit straight into the wall. Cosgrove nearly levelled on the stroke of half-time, the big striker got his head on the end of McLennan’s cross but Woods stuck out a strong left hand to deny Cosgrove and tip it round the post for a corner. The resulting set-piece again ended up at Cosgrove but this time he blazed his effort well wide on the half volley. Both teams came out unchanged for the second half – The Dons knowing that a much better performance would be required if they were going to take anything from the game. Aberdeen’s top goalscorer Sam Cosgrove looked the most likely to provide the equaliser. The striker had an effort cleared off the line after McGinn delicately touched it back into his path. Shinnie was the next to go close for The Dons. The captain made a positive forward run from midfield, splitting the Hamilton centre backs. Stewart spotted the run and expertly picked him out. Shinnie got to it first and got a toe on it before the keeper but the ball didn’t dip in time and sailed agonisingly over the bar. Stewart was coming into the game more in the second half and he caused chaos with a dangerous ball into the area. After a couple of ricochets, the ball fell to Dom Ball who swivelled and hit a half-volley on the turn. The ball was always rising and clipped the top of Woods bar on its way over – another great chance for the home side. 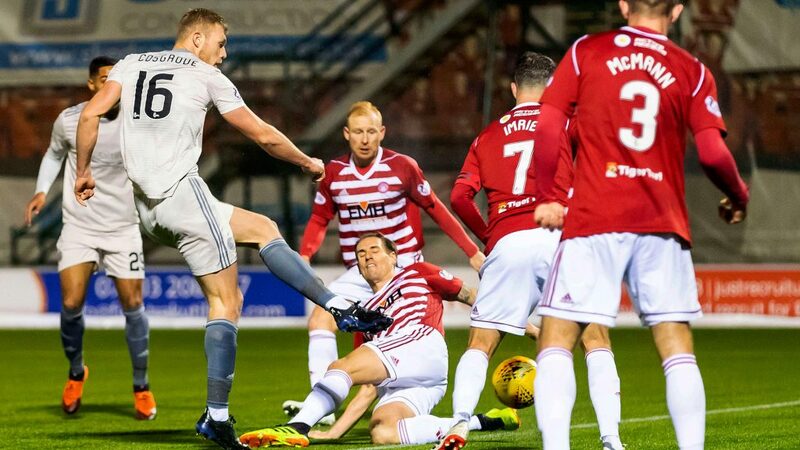 It was beginning to look like one of those nights for The Dons, and the night went from bad to worse when Hamilton doubled their advantage through Miller. The Aberdeen defence failed to clear their lines and were made to pay when the visitors found Miller in the area and he smartly converted first time. The Dons were throwing everyone forward in search for a way back into the game. With twenty minutes left to play, Considine passed up a golden opportunity. McGinn twisted and turned down the left-hand side and put in an inviting ball between the penalty spot and six-yard box. Considine was there but completely misjudged his header and failed to make a connection. The Dons huffed and puffed but seemed rushed, lacking real quality in the final third. Stevie May was thrown on up top for Dom Ball to try and disrupt the Accies back four. Meanwhile, the visitors were doing everything to slow the game down which prevented Aberdeen from gaining any momentum or pressure. Into the final ten minutes and it was McLennan who fluffed his lines at the vital moment in an attempt to pull one back for Aberdeen. Now on the left-hand side, the winger did brilliantly to beat two men, cut inside and get himself a clear sighting at goal. But he snatched at the chance and blazed his effort well wide, effectively summing up Aberdeen’s night. Four minutes of added time were signalled but The Dons couldn’t make their dominant possession count and fell to a disappointing 2-0 defeat.